A hulking freighter waits at a darkened pier. Aboard, filmmaker Carl Denham prepares for a strange voyage to a distant island... an island where he hopes to make the most exciting movie of all time. First mate Jack Driscoll has concerns about the journey-concerns that only grow deeper when Denham talks a down-on-her-luck beauty named Ann Darrow into joining them. And what waits for them at the end of the journey? More danger and excitement than any of the three could have imagined. For what waits at the end of the journey is... Kong. 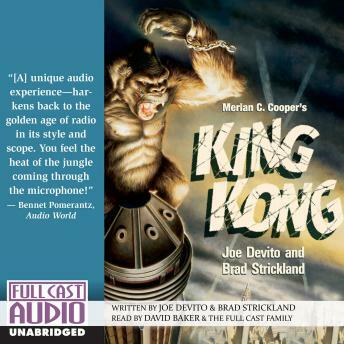 Join the showman, the sailor, the blonde, and the beast for one of the greatest adventures of all time, as the actors of Full Cast Audio sweep you into the pulse-pounding epic of King Kong, Eighth Wonder of the World!